Can the Chiefs keep Mercury Morris worried? For the second straight week I will not be looking at a specific player for analysis but rather a team. Last week we checked out the Seahawks “Cover 3Hawk.” The Chiefs are a much different breed in their ever changing defense. Chiefs excel in showing several different defensive formations. Chiefs, with the injury to Atkins, may have the best interior line player not named JJ Watt. First let’s talk about the Broncos. We know all the names, but what are they trying to accomplish on offense? The Broncos run a typical zone style run game. Their offensive line will, in unison, all step in one direction and try to create a gap for the RB to cut through. It should go without saying that their passing game is extremely deadly. They love to run flood zone routes. These are specifically ran with Decker and Welker going high and low in their route tree. The Thomas’ find success when matched up one on one. None of this should come as a surprise. Manning spreads the ball around and loves to hand the ball off when teams only have 6 in the box do to a soft 2 deep safety. Ok, so lets get into the Chiefs. Brandon Flowers has been an above average corner for years. Unfortunately he is being exposed this year. He is seeing a lot of targets and allowing 65% of passes thrown at him to be completed. QB’s have a 89.3 passer rating when throwing at Flowers. But the other DB’s have stepped up their play. Eric Berry has been terrific in pass coverage. QB’s are 52.6% when throwing passes at Berry but Berry has only given up a total of 152 yards. Really, Berry has been nearly flawless outside of the Tennessee game(allowed 5 of 6 passes to be completed for 58 yards). I decided to look at the Cowboys game as the Cowboys pass offense is setup similar to the Broncos. They run out of spread and pistol and have a very deadly receiver in Dez Bryant as well as other threats such as Witten and Murray. No one is the Broncos but the Cowboys give us a good idea of how the Chiefs may play the Broncos. In this first screen cap we see a cover 2 look. Our 2 safeties circled in blue. Sean Smith, the right cornerback, is in red while Brandon Flowers is at LCB and circled in yellow. Flowers is matched up with Dez on this play. Lastly our player circled in orange is Jason Witten. The Chiefs are in a cover 2 look with those 2 deep safeties. But have adopted the Wade Phillips 5 man front scheme from the Houston Texans. This takes advantage of a teams strength of interior players by putting two contain players standing up at the line. This allows for an ease of gap responsibility out of most of the line. OK, post snap we get a little bit of chaos going on. Flowers on Dez is a given. But the fullback out of the backfield(circled in black) has to be picked up by Tamba Hali, normally a pass rushing outside linebacker. But our outside WR is cutting inside while Witten is going for either a corner route or a seam, most likely dependent on how the safety reacts to the crossing route between he and the WR. If you notice the LBs are just floating to their positions. 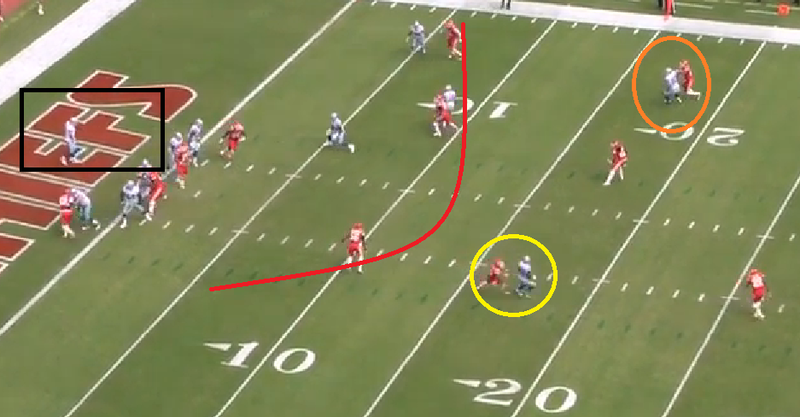 A sidenote: This was a play action pass and if you read my article on the Giants run game (http://zonereads.wordpress.com/2013/09/21/why-is-the-giants-run-game-so-important/) you’d see how defenses typically react but the Chiefs seem to be quite disciplined. I just want to note Sean Smith and the safety and where their eyes are. Both are looking at the crossing route and how they react will tell us a whole lot about the defense. Let’s pick up where we left off in the last screencap. The WR did a whip route(this is when you push your route inside and then made a sudden move back to the outside flat to the line of scrimmage) and the LB picked him up while the safety dropped into the box. Sean Smith stuck with the deeper route and is on Witten. This is a type of robber coverage where the safety attacks the box more freely and can lead to an errant throw if the QB is expecting the safety to be attacking the deep half instead of the middle. 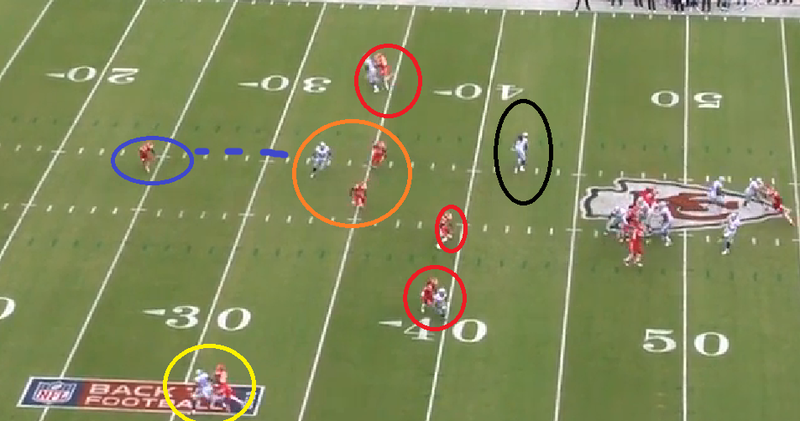 This is essentially a cover 1 from the Chiefs with their one single high safety who has bracketed Dez Bryant, who Flowers does a great job covering. The two backs out of the backfield are relatively accounted for. Murray is the back at the 5 yard line near the hash marks but has the nearside LB bearing down on him. Lastly, this screen cap is immediately following Romo’s release. Look at the pocket. The Chiefs failed to get pressure on Romo but still forced a checkdown pass to Murray, the ball ended up being throw into the ground for an incompletion. Romo may have read the defense correctly but the coverage was so good that despite having time there was nowhere for the ball to go. We have a very familiar cover 1 look. 3 DB’s are playing up on the ball. Yellow circle is Brandon Flowers on Dez Bryant. Our red circles are showing the man to man responsibilities. We see a 6 man box against the Cowboys empty, almost daring the Cowboys to throw it deep. 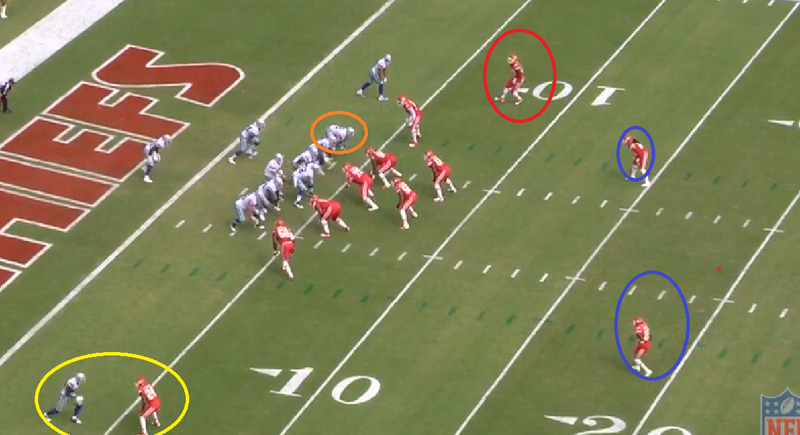 The orange circle is again Jason Witten with the two Chiefs LBs circled as well. We have 2 downline and 2 standup ends for the Chiefs in this spot. Against the empty look they choose not to have a 5 man front. Our single high safety means that the DBs can push their players to the middle of the field for safety help. 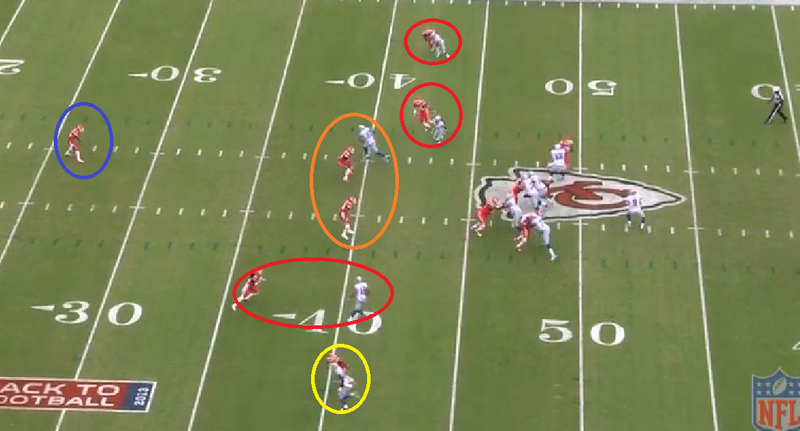 The Chiefs rush 4 and are sitting comfortably in their man to man coverage. The LB’s know they have safety help behind them so their job to just to get depth. And if someone crosses their face they will run with that player. The thought process is that with an empty set a single one on one victory from the DL the play will be over rather quickly, whether its Romo getting rid of the ball or a sack. I’d like to note that all the DBs, by playing up on the line outside of the slot WR to the defensive right, now have all the WR’s up on them. There is no room for error at this point and the DB’s are forced to turn and run. We see how the play has developed. The perceived man coverage has turned into another smoke style coverage, though even more advanced. The orange circle is a DB and a LB while our slot DB has ran up on the whip route in front of him, the LB also pushed with the whip route that cross his face. Unfortunately the whip route on the other side of the field was not defended as well and the DB pushed the middle of the field towards Witten instead of the WR. Our Safety has his eyes on Witten and Sean Smith the LCB has good coverage. Flowers is not looking as good. Playing up on the ball cost him as Dez ran past him. 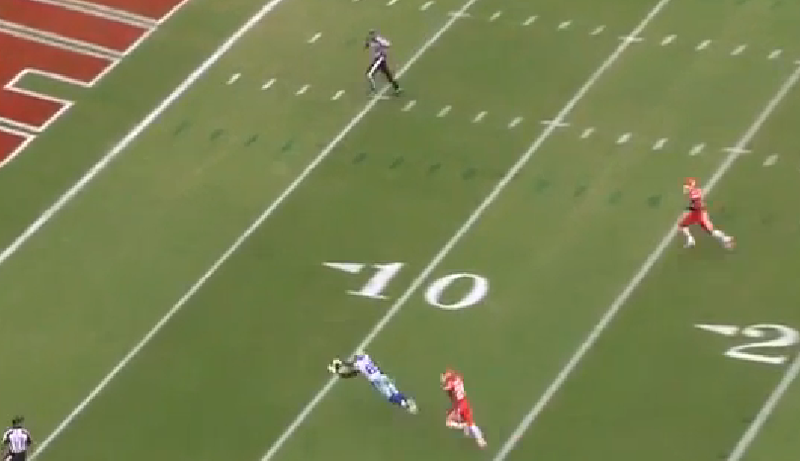 Flowers coverage wasn’t awful, it took an overthrow and a diving catch to beat him here. But a little more accurate pass and this may have been a touchdown. An aggressive play led to one of the best WR’s in the game shooting past Flowers. Demaryius Thomas will know about this coverage and this play and I will guarantee at least one play identical to this one if the Chiefs line up in a similar coverage against the Broncos. Here we will look at the Chiefs Run D. Against a TE left Pistol the Chiefs line up with 3 down linemen with a wide 5/9 edge rusher and two LBs in the TE box. I’ve drawn the Cowboys run blocks, its backside reach left with a cross block from the Cowboys LG/LT. The LT will block down on the 3 technique while the LG will pull and attack the MLB. 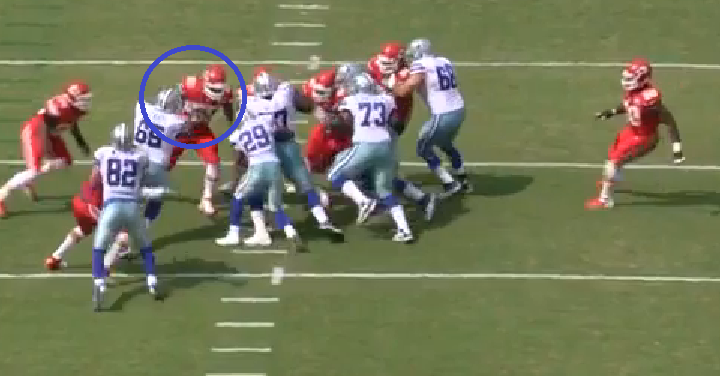 The LB over Witten will go with Witten to the outside. Is a big play about to hit? I circled the LB that the guard was to pull and seal on. He beats the guard and with that the rest of the Chiefs DL has rode down very well taking away every single cutback lane with them. The backside LB has kept contain. Chiefs hold their gaps very well and against the Broncos zone run they should see plenty of successful plays to force the Broncos to throw. One player makes this defensive line special and that is Dontari Poe. Poe is listed at 6’3 346. He can definitely look like a player who plays like that when he is holding the point against 2 blockers. But the impressive thing about his is just how nimble he is. On this play Travis Frederick, the center the Cowboys reached on in the draft, has Poe one on one in a pass blocking spot. Poe attacks Frederick’s right leg, Frederick constantly oversteps but against a 346 pound player it should be a bit safer than most. Poe’s stutter step into a flawless swim move leaves Frederick blocking air. This ends up looking like a very easy sack with Frederick overlooking the carnage. To be fair to Frederick he is one of many to look silly against Poe. On a goalline play against the Bills we see Poe lined up on the guard. 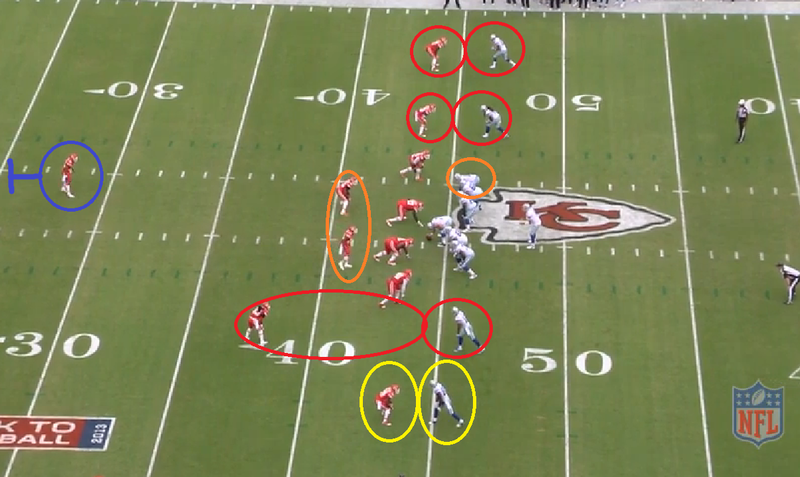 Chiefs are in a 7 man front against the unbalanced Bills line. The Bills guard is to reach to his right and cutoff Poe. This time Poe is patient allowing the guard to gain leverage. But Poe knows this is a shotgun run and a little longer developing. He stutter steps again. Another offensive linemen is left blocking air. Poe makes a tackle for a loss on a play that would have been a walk in touchdown had he not beat his man. Two notes. #60 is on the ground looking back, likely in awe. And the black circle. The Chiefs playing very disciplined football with the backside player spying the QB so if this was the well known read option the QB would have been planted as well. I’d like to point out that the play after this one is a Pick 6. Now what does this all mean? I did not even get into Justin Houston or Hali nor did I give the LB corps the love they deserve. This team can matchup better than just about anyone against the Broncos offensive line. The Jaguars were able to get pressure on Peyton early in the game with a defensive line that I would consider by far the worst in football. Broncos offensive line has routinely look shaky. Beadles, the LG, has had moments of looking like a sieve. Chris Clark is not Ryan Clady. Louis Vasquez has been playing the best out of the Broncos offensive line and he will have his toughest matchup of the year yet against Dontari Poe. I worry about the Chiefs back end. Berry should be just fine if given the responsibility to cover Julius Thomas. Sean Smith should matchup with Decker quite well. Brandon Flowers vs Demaryius Thomas is one I just don’t have a good feel against. If Flowers can successfully jam it will go a long way. He held his own against Dez and Thomas is not Dez. Marcus Cooper, the Chiefs nickle, will likely see a full slate of snaps against Wes Welker as I expect the Chiefs to sit into a coverages similar to what they showed against the Cowboys empty set. Though the Broncos have shown some flaws against the 2 high safety look. I do not have a good feel on how the Chief’s offense can attack the Broncos. Smith can be very accurate. 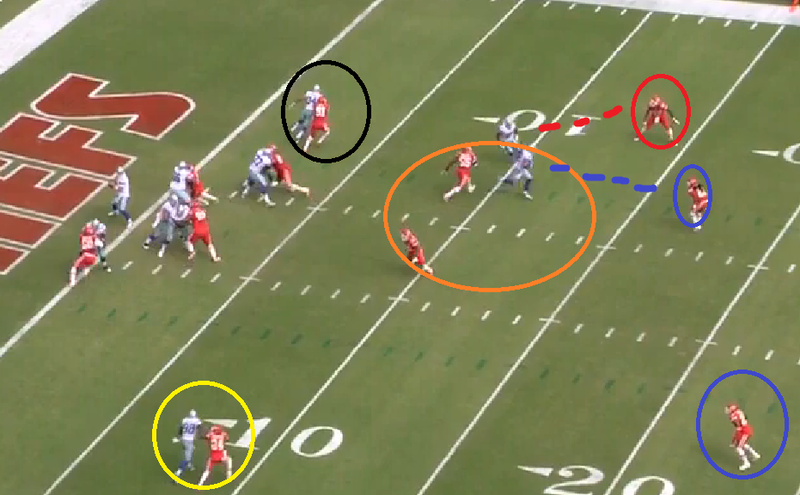 I think the Chiefs will try to move Jamaal Charles to the outside as a WR and attack with a fade route against a LB. They’ve shown this a few times this year. That will be their big play opportunity. Otherwise the inside zone run and counter zone run that the Chiefs have run to almost perfection this year will be their bread and butter. This game being in Denver sounds daunting but it’s expected to be quite cold, the low is 21 degrees. Maybe that is the equalizer that the Chiefs need. A high ankle sprain in cold weather is not something that sounds very good to me. I think the biggest thing for the Chiefs will actually be forcing Manning into being one dimensional. I’m not suggesting bringing another safety into the box to stop the run. But for Jackson and Poe to continue their dominance and take on 4 blockers to allow the LBs to freely scrape. Stopping the run with 6 guys in the box and 5 deep goes a long way in limiting Manning. Throwing against a 2 high safety coverage each and every play when you don’t have a play action pass to lean on is a daunting task even for the greats. So can the Chiefs keep Morris worried? With their offense you think there is no chance. But with Dontari Poe, Justin Houston, Tamba Hali, and their defensive backfield. Morris could very well be waiting a little bit longer before popping that champagne. 2 comments on Can the Chiefs keep Mercury Morris worried? Dope. Defensive breakdowns are great, keep up the awesome blogs.